"Of all the kinds of singing I've done, there's one that has always been of the greatest importance to me. I found out early in life that it's not only fun, but it means a lot to many people. 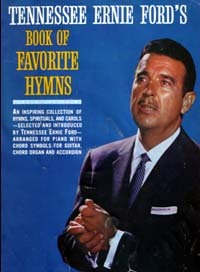 What I'm talking about, of course, is teh singing of hymns, spirituals, and gospel songs. "There's a well of sacred songs so deep that you can dip in it all your life and it will never run dry....I think the main purpose of singing these songs is enjoyment—you dn't put on sackcloth and sit in a pile of ashes. Some hymns may be a bit more on the serious side, and some spirituals may move faster and you'lll want to clap your hands. But whether the tempo is fast or slow, or the song is sung by one person or a huge choir, the same message is there. "Of all the singing I do, the hymns, spirituals, and gospel songs not only give me great pleasure but seem to be something that truly needs to be done. And I'm mighty glad to say that many people feel the same way. Sure, some of them may get all steamed up about big new love songs that come along, but let's not forget that hymns and spirituals are the finest love songs of them all."